“Fascinating New Yorkers” is a collection of Clifford Browder’s posts from his blog: No Place for Normal: New York. He organizes his stories into six sections. These include: Dark Desires, Men of Power, Remarkable Women, Creators, Celebrities and Bohemia. Within some of these chapters are subchapters that discuss more eccentric characters including John Gotti. There are also other notable eccentrics whose names are mentioned, such as Donald Trump. Browder does an excellent job of vividly describing the characters and the settings. He even piqued my interest with the ones that were new to me. I found myself going to the internet to get more information or even look up the addresses that he named. One of the addresses was even on Zillow.com with beautiful photographs and a price of $21,000,000! Having grown up in New Jersey, I remembered David Berkowitz, a/k/a Son of Sam, terrorizing the young residents of New York. I also remember the relief that everyone felt when he was caught. Browder provided a lot more information than I knew at the time and it was interesting to be updated. Other notable names that I had already heard of were JP Morgan, Al Sharpton, Helena Rubenstein, Ayn Rand, Anais Nin and Andy Warhol. The list goes on, but it was really fun to hear the juicier details about their lives! Browder also provides a community service by educating his readers about historical events that happened during the lives of these characters. He even got to meet several of them in person. I also appreciate that he provides some references about where he derived his information or notes when something is a common rumor but hasn’t yet been backed up by fact. Readers will enjoy Clifford Browder’s lively, descriptive writing. Fans of non-fiction and more recent history will really appreciate the research that he put into these pages. His writing will definitely captivate your interest as it did mine. 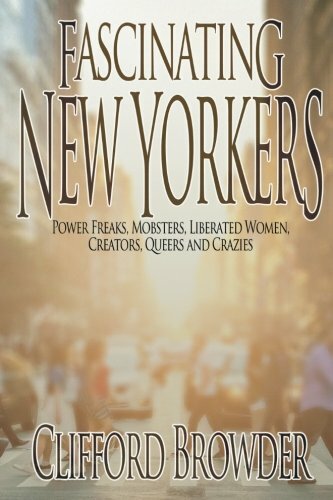 “Fascinating New Yorkers” is a pleasure to read and I look forward to reading more works by this author.